There is no clear distinction between films that have been classified as part of ‘New Indian Cinema’ and those that have been termed ‘Parallel Cinema’. The description ‘new cinema’ implies a connection to the idea of a ‘New Wave’ – a distinct movement in a national cinema that seeks to be different in some way from the mainstream, possibly as a means of ‘re-inventing’ or re-defining what cinema might be. The most famous New Wave came out of France in the late 1950s and was partly responsible for the development of film studies in Western Europe and North America. A British New Wave and New German Cinema emerged in the same period and the 1960s and 1970s was a period for re-defining the possibilities of cinema, especially in terms of more ‘political’ and socially-conscious filmmaking. International Film Festival of India – first held in 1952, becoming an annual event in 1975. Important in (a) bringing internationally known filmmakers to India and (b) providing a showcase for Indian filmmakers which was not dependent on commercial considerations. The Film and Television Institute of India (FTII) set up in Pune in 1960 (Television being added to the curriculum in 1970). The FTII has attracted many of the leading figures of the Indian film industry as tutors and the graduates of the 1960s were important in promoting the idea of new/parallel cinema. National Film Archive of India was set up in 1964 as a government agency in Pune with branches in Calcutta, Bangalore and Thiruvananthapurum. The NFAI ensures preservations of ‘Indian film heritage’ and also provides facilities for indian and international film scholars. The Film Finance Corporation was set up in 1961 to fund ‘independent’ and ‘experimental’ films. This was also a government initiative. Later it became known as the National Film Development Corporation and extended its work to include distribution of films both within India and worldwide, promoting the films it financed and using distribution to increase access to world cinema. Doordarshan, the state television channel has also funded film production. new stars with a different approach to performance. Overall, the new cinema was more aligned with international art cinema. It was not profitable, with only limited box office success, but the films increased India’s prestige in international cinema and they were welcomed by audiences drawn from the developing middle class. The new/parallel cinema died away in the late 1980s and now some commentators have identified a shift in popular cinema that connects some of the older new cinema personalities with new creative talents and an increasingly affluent and educated audience. One of the first graduates of the new Film Institute, Shahani, born in the Sind (now part of Pakistan), became one of the important figures of the new cinema. He was important as a writer and theoretician of film as well as a director in collaboration with his Institute colleague, K. K. Mahajan. He spent time in France in the mid-1960s, assisting Robert Bresson. Tarang (Wages and Profits) (1984) was the second major feature for Shahani and Mahajan. Rahul, the son-in-law of an old industrialist, and one of the heirs to his fortune, clashes with Dinesh, the industrialist’s nephew who is openly unscrupulous. Rahul, for his part, conceals his personal ambition under a cloak of liberalism and encourages indigenous production. In the centre of the conflict sits the wily old man, with money as his sole concern. His tense and elegant daughter Hansa watches him like a hawk, for he is the only man she has ever completely loved. Outside the palace and its intrigues, are the hovels of the workers in the old industrialist’s empire, where Janaki lives. Janaki’s dead husband had once led an agitation against the management, and Janaki herself is still considered potentially dangerous. Thrown out of her shack by the industrialist’s henchmen, she is picked up from the streets by Rahul and installed in his palatial home as a nursemaid for his child. As Janaki becomes increasingly indispensable, Hansa quietly withdraws, pushing Janaki into a relationship with Rahul. Having done her duty by producing a son and heir for the family fortunes, Hansa now turns her full attention to her father, her sole obsession. But when the old man falls ill, Rahul keeps Hansa away from her father, and with Janaki’s help, contrives to remove the nurse, a secret tippler, often from the sickroom, leaving the old man neglected. One day, the nurse comes back and finds her patient dead. Dinesh, who returns from one of his tours abroad, accuses Rahul of killing his father-in-law, but there is no evidence. With the help of Anita, an old paramour and the old man’s erstwhile secretary, Rahul puts Dinesh in a false position with his foreign collaborators. Dinesh’s local ally, a crooked trade union leader, is silenced by Janaki and her worker friends. Rahul sends Janaki away to a bungalow in the hills supposedly to protect her from any investigation arising out of the old man’s death. Meanwhile he buys the allegiance of a section of the workers, and comes back to tell Janaki that she will be accused of murder. Janaki, betrayed but free, walks back to her old life on the streets. In Rahul’s home, Hansa tries to arouse herself from her grief. After a long time she makes love to Rahul, and wakes up with the promise of a more fulfilling relationship. Yet by the evening she is dead, submerged in the bathtub. Rahul removes his last obstacle by implicating Dinesh in a murder, and takes charge of his empire. Janaki sets fire to the brothel and returns to the shack of a worker friend. As she waits for him to return home, someone throws a lighted cracker in the room. Janaki escapes as the row of shacks goes up in flames. Tarang, Kumar Shahani’s second feature film, is a saga of conflict and betrayal stretching across the boundaries of different worlds. Bridging the gulf between them is Janaki, forever betrayed, forever alone. In the last sequence, where the myth takes over from the real, Janaki’s persona extends from the exploited victim of human ambition to a celestial embodiment of freedom. She is desirable, but can no longer be used, for she has the choice denied her in the real world, of going her own way without surrender. Perhaps the polarities will finally converge at the end of the long bridge, perhaps there is hope for a common destination. One of the brightest alumni of the Film and Television Institute of India, Shahani was greatly influenced by Ritwik Ghatak, the controversial film maker and teacher from Bengal, and D.D. Kosambi, the great Indian polymath. Though he writes rarely, he remains one of the most promising film theoreticians in India today. His films are even more rare, a few shorts and documentaries, and one other feature film, Maya Darpan, made in 1972. Very recently, Shahani got together with playwright G. Shankar Pillai and actress Alaknanda Samarth to stage two unusual plays, Kunti and The Human Voice, which received rave reviews in Bombay. Tarang, like his first feature film, is not easy to assess, nor will it ever be received by the general audience with understanding or enjoyment. It is slow, larger than life, and undoubtedly intriguing. Smita Patil was born in Pune in 1955. After studying literature at Bombay University, she worked briefly as a TV newsreader, before being spotted by director Shyam Benegal. 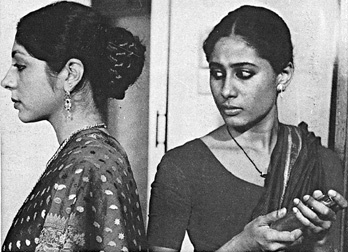 She became a star in Bhumika (The Role) (1976) for Shyam Benegal. When she died following complications after childbirth, she was one of the major stars of parallel cinema alongside Shabana Azmi. In her short career she made 32 films, including some that are classified as popular Hindi Cinema. This entry was posted in Indian Cinema and tagged Indian Parallel Cinema, neo-realism. Bookmark the permalink. Many thanks for creating Parallel or New Cinema in India | The Global Film Book Blog, truly love it.